This was my personal favorite from this year’s cookie swap. The bark was so festive, and who can resist the combination of chocolate and mint? Thanks for sharing the recipe Catherine! 1) Line cookie sheet with wax paper. 2) Unwrap candy canes, place in zip-top bag and crush. 3) Melt milk chocolate in double-boiler or microwave. 4) If desired, mix 1/4 tsp. peppermint extract into melted milk chocolate. 5) Spread milk chocolate evenly over entire cookie sheet. 6) Place cookie sheet in refrigerator for approx. 15-20 minutes. Check to see if chocolate has set before proceeding to step 7. 8) Mix 1/2 of the crushed candy cane into the white chocolate. 9) Spread melted white chocolate over the hardened milk chocolate. 10) Sprinkle remaining crushed candy canes on white chocolate. 11) Place cookie sheet in freezer for at least 30 minutes. 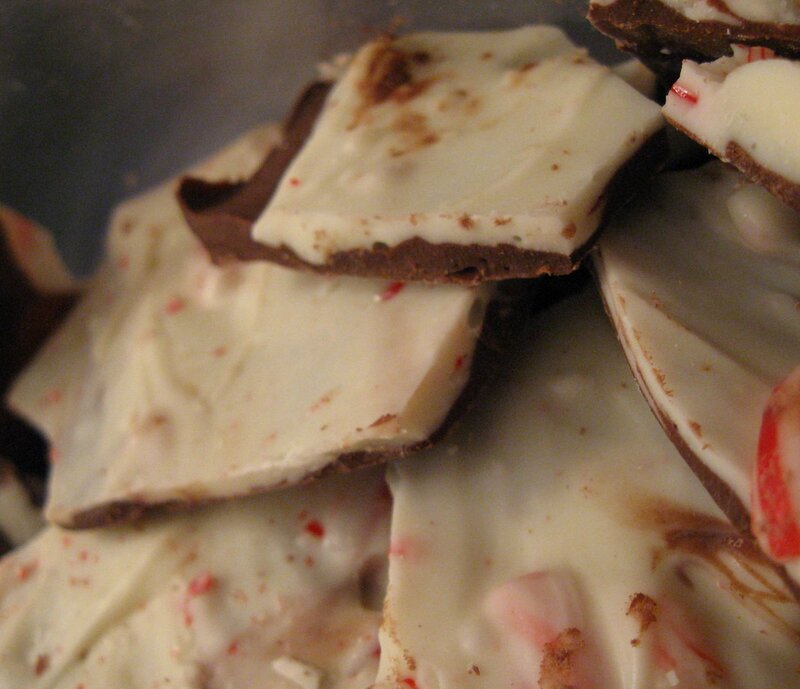 When chocolate has hardened, break up peppermint bark. If you melt the chocolate in the microwave, go low and slow so it doesn’t seize or scorch. White chocolate is particularly fussy. It’s always good to have an extra bag on hand, just in case. I usually start heating for 1 minute at 50% power and then heat at 30 second intervals until it’s sufficiently melted.